With more than 22,200 students attending Bossier Schools, the school district is one of the fastest growing districts in Louisiana in enrollment and performance. That’s why it is so important to hire new teachers that can keep up with the demand. 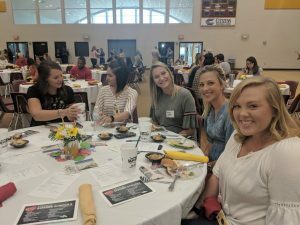 On Thursday, July 26 at 11:30 a.m. in the BPCC gym, Bossier welcomed over 165 new teachers at a luncheon hosted by the Bossier Chamber and sponsors Barksdale Federal Credit Union, Johnson’s Furniture and Mattress Gallery, Cyber Innovation Center and Breathe America. 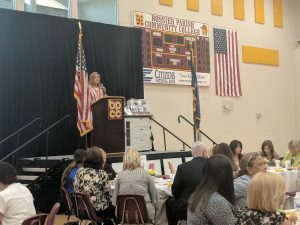 These teachers got to hear remarks from Superintendent for Bossier Parish Schools Scott Smith, Bossier Chamber of Commerce President Lisa Johnson and Bossier Youth Leadership committee member Bonnie Dubin. Dubin gave a talk on the 5 things that make a great teacher. She used pictures of items to illustrate the qualities that a great teacher should have. Among these things Dubin listed a rubber band for flexibility, a mirror for reflection, an eraser for erasing mistakes, a key for unlocking potential and a puzzle piece for working together. She says each teacher should work with their staff to help better the students’ learning experience. Among the new teachers was Rachel Smelley. This school year she will be teaching 3rd grade at Haughton Elementary. She is excited for the new opportunity. Smelley says her goal for the year is to be as intentional with her students as she can. She hopes that parents will take advantage of the resources that are available to them. 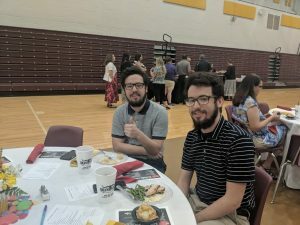 Kevin Gallion will be teaching 4th grade math at Meadow View Elementary and he agrees that parents should get involved in their child’s learning. He says the parents are the foundation. He hopes he can be a good role model for his students. At the luncheon, many teachers also walked away with amazing door prizes from sponsors called New Teacher Supporters. 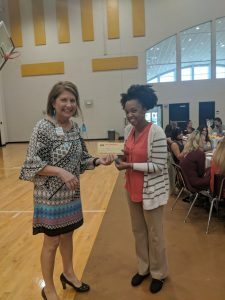 Farryn Cooper, new teacher at Parkway High School, walked away with the largest prize at the luncheon. She got a classroom set of laptops for her students. She is excited to teach English II this year. If Cooper could give one tip to parents it would be for them to stay in constant communication with their child’s teacher. She said they shouldn’t hesitate to reach out this school year. The new teachers also got to hear words of encouragement from Superintendent Smith. He reminded them to show enthusiasm as they step into their new roles. Previous Post:Like a Boss: Paul Reiser at Reiser Sonic Group Mgt. Co.